THE SPOTTED HARE: Oh Happy Day! Audrey of Bay Ray's Child is the winner of sweet Berry Bunny. A big thank you everyone for your sweet comments and birthday wishes! to offer a birthday give-a-way! Each year, it seems, passes more swiftly than the one before it. I look at the calendar to find it's 3 months behind. turns 3 ~ really? ~ 3? new memories are created to savor in the future. I am grateful ~ for another year. 365 more days to spend living, loving, exploring and creating! please leave your comment on this post! I will draw a winner Sunday evening about 8pm. Oh Lori Ann - Please please pick me for that gorgeous sweet little berry bunny. I hope you have a marvelous mothers day weekend and thanks for sharing this giveaway opp for your beautiful creation. He's darling, but then all of your work is wonderful. I hope you are having a wonderful birthday and enjoy a great mothers day. Oh how sweet! I would love to win that wonderful creation. Thanks for the chance and Happy Birthday to you! Ah, so nostalgic and sweet. But your creations always are. Happy Birthday, what a great way to celebrate a birthday. Lori, hope you have a very sweet birthday and a lovely Mother's Day!! Thank you for offering one of your beautiful treasures!! Being a Grandmother is wonderful, don't you agree? Happy, Happy Birthday! I love your birthday as much as mine that was last month! You always treat us too with such beautiful little creatures. Thank you so much and again HAPPY BIRTHDAY! Birthdays are a blessing, aren't they? I cherish every wrinkle. :) And what a blessing it would be to welcome that delightful bunny into my home. Thanks for this sweet giveaway and Happy Birthday! I love the strawberry the litte bunny is sitting on. So cute. I want to wish you a very happy birthday Lori!! My birthday is next month.I so hope I win the sweet sweet little bunny on the beautifull pinkeep, so nice of you to give it away,just lovely!! I hope you have a nice birthday and mothersday weekend!! What a wonderful outlook on life....Happy Birthday and best wishes for many more. Hope you have a wonderful day, and what a great outlook on life. I love your work, it is wonderful. Thanks so much for sharing! Happy Birthday to you and everyone else born today! Your work/creations are amazing. I would feel so blessed if I were to win this adorable mouse on the strawberry. Oops! I mean bunny not mouse! Sorry!! Happy Birthday! Thanks for the chance to win one of your creations. The bunny pin cushion is too cute, would love to win. Happy Birthday and Mother's Day. Oh Lori Ann! I am in love with your berry bunny keep. I would be most honored if I am the lucky winner of your giveaway. A Berry Happy Birthday my friend!!!! I hop you are enjoying this special day. CELEBRATE!! Happy Birthday! Your creations are fabulous in a fairytale-like way! Happy Birthday! Love your work, thanks for the opportunity to win one of your creations. The bunny is so incredibly cute- just like all your pieces. Please submit my name for the drawing. Happy Birthday Lori, your bunny is adorable, I would cherish him if I was lucky enough to be picked! Oh my gosh, this is just the sweetest little pincushion,Lori! I love your post today...it's so true how time goes by in the blink of an eye. Wishing you and your family all the best 365 days a year. Pls pls pls ....I am a bunny person.....have wild ones in the yard .......pls send me one of yours!!!!! Two of my favorites together - bunny and strawberry! Wishing you a very Happy Birthday! ......berry bunny, berry bunny bring me luck! You are too adorable for words. It is true... it seems as we age time passes faster. Enjoy your special day and thanks for sharing it with us in a wonderful way! What a sweet pin keep! Happy Birthday!! Here's to 365 more days of wonderment! Happy birthday! Your creations are so beautiful. Please enter me in your wonderful give-away. I'd be honored to call it mine. Happy Birthday...I'm called Bunny by our grandchildren and I love strawberries..perfect. Your work is amazing. The detail and quality of your pieces are fantastic. Happy Birthday, Lori! Time flies when you are having fun, doesn't it? Have a great day! I can't believe it's time for another of your birthday giveaways! Happy birthday to you! Boy, the time does go fast! Such a generous and beautiful birthday tradition! I was at Peninsula last week at the Create - thanks so much for your leadership in this wonderful experience. Your items are the tops! Hi Lorri Ann, what a beautiful post. I can relate to every thing you talked about. Family, that are so precious and friend who I hold dear, gardens who shower us with beauty, and the ability to create. Every day is a blessing even though the year is racing by. I would love to enter your competition to win you "Sweet Bunny" I admire your work so much. Happy Birthday Lori Ann!!! I hope you had a fabulous day!!!! Beautiful! So nice of you to celebrate your birthday with a giveaway! What a lovely tradition you have, Lori Ann! It is so true; how the years seem to fly by. Happy birthday and best wishes for another year of creating beauty and joy. Hoping your birthday was wonderful. Would love to win. I'm in total agreement! Love your creations and would really like to give that cute bunny a new home..mine! Thanks Lori Ann. Hope you have a wonderful birthday! How generous of you to give a gift to celebrate your special day!!!! I wish you a wonderful birthday and lots of health and inspiration. Happy Birthday,Lori Ann! I love all what you do,and this sweet bunny just perfect!. Happy Birthday, I wish you many many more, and Happy Mother's Day, what a sweet giveaway, thank you for the opportunity! Happy Birthday dear, sweet friend. I wish you all the happiness in the world in these next 365 days and beyond. So sweet! Your dear creations always touch my heart. My little granddaughters, Elisabeth and Emma, are here and we have spent the day picking flowers and looking for baby cottontails down in the garden in the afternoons~ this sweet pinkeep with the tiny sleeping cotton tail bunny baby with it's own wee strawberry to rest upon reminds me of these past few days~ you are such a wonderful memory maker! Happy Borthday! Oh my, what an adorable bunny. So sweet. I have a collection of pin cushions. This would be a wonderful addition. Thanks for the chance to win. Thanks so much for the chance to win. Love pincushions, and bunnies, too. Happy birthday (mine's in 2 weeks)! How sweet of you to want to share your Birthday by gifting someone with such a special treasure...made by your hands and heart!! I make and collect pincushions and would be so honored to add this darling pinny to my collection! Yes, time has a way of moving faster and faster and I find myself saying those very same things!! I hope you have a wonderful Birthday and Mother's Day.....celebrating YOU!! Hi Lori, Happy Birthday !! You know I would love to win this sweet bunny pin cushion !! Oh my goodness! Another year has come and gone already! A very happy birthday as well as Mothers Day to you! I am celebrating my very first Mothers a day as a Nana! She us such a blessing! I feel so honored and happy to have won Berry Bunny! Thank You so very much Lori! This is so special to me because you are one of my favorite artists! 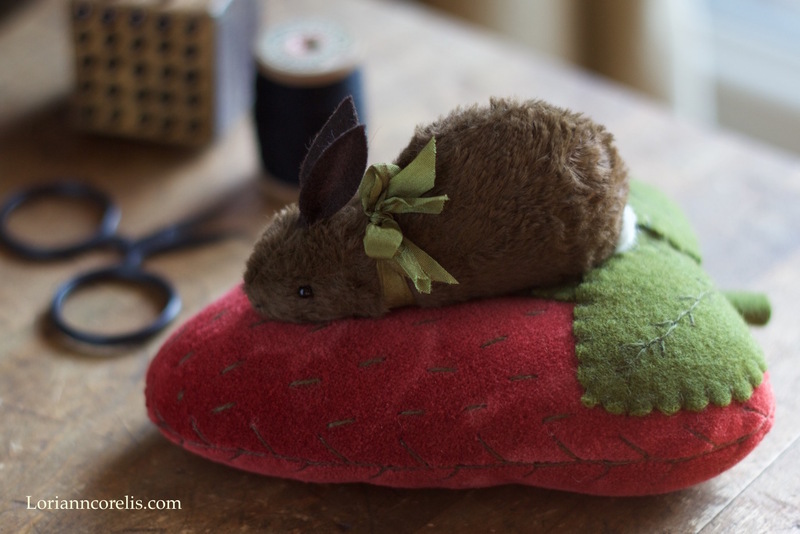 I've never seen anything sweeter than that precious bunny resting on that beautiful strawberry! Thank you for sharing with us!